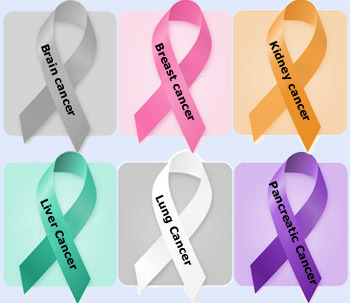 Cancer awareness ribbons The good news is that many forms of cancer can be avoided, and with early detection, a great number can be cured. Of all the diseases that are plaguing the mankind, heart disease and the cancer are the lethal ones. Mountain of evidence and years of study points to cancer as the single most important risk factor that many people all over the world suffer from. Cancer is the second leading cause of death all over the world next to heart disease claiming more than half a million lives every year. A cancer diagnosis is a traumatic moment in one's life and it is no less terrible for those in a position of supporting a cancer sufferer. While the experiences that the cancer patient and the support person will have may differ, there is a commonality in worrying about the outcome and the patient's emotional health. Cancer patients are in desperate need of new treatment options. The good news is that many forms of cancer can be avoided, and with early detection, a great number can be cured. Recent breakthroughs in cancer treatment have led to an unprecedented growth in the number of therapies now in clinical development. In this article, we will look at the many faces of cancer so that you can understand the disease and its treatment, and also you can learn about steps you can take to limit your exposure. Cancer: Out–of–control cell growth Cancer cells are not normal and divide rapidly and continuously, creating tumors that crowd out normal cells and eventually rob healthy tissues of nutrients. Cancer is a disease that begins as a renegade human cell over which the body has lost control. In order for the body and its organs to function properly, cell growth needs to be strictly regulated. Cancer cells are not normal and divide rapidly and continuously, creating tumors that crowd out normal cells and eventually rob healthy tissues of nutrients. The cells of an advanced tumor can separate from the tumor and travel to distant sites in the body, where they take up residence and develop into new tumors and lumps at their own speed. 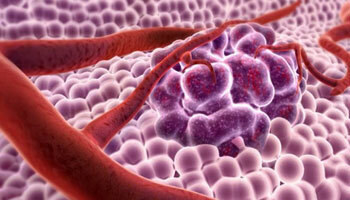 This phenomenon is referred as metastasis (spreading of cancer form one place to another). 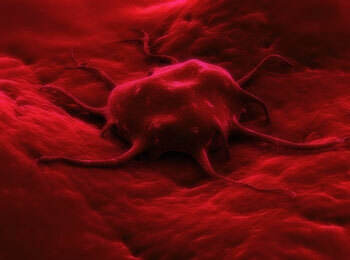 One of the frightening things about cancer is the possibility of metastasis. When cancerous cells metastasize, they can gain access not only to the circulatory system, which includes blood vessels to transport the blood, but also to drift virtually anywhere in the body. 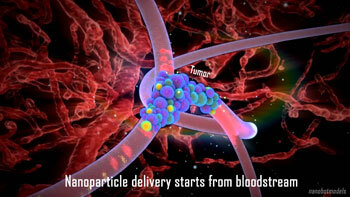 This is the process where millions of malignant cells are released from the tumor (the primary) into the bloodstream. What causes cancer? There is no one single cause for cancer. Scientists believe that it is the interaction of many factors together that produces cancer. DNA mutations is one of the them. Cancer is caused by a number of factors, some of which we can control, and some we cannot (that are caused due to DNA mutations). The factors which we can control or avoid are as follows. Certain exposures and behaviors, called risk factors, increase a person's risk of obtaining a disease. General risk factors, for virtually all cancers, include tobacco use. Chemicals present in cigarettes and cigarette smoke have been shown to increase cell division, inhibit a cell's ability to repair damaged DNA, and prevent cells from dying when they should. The other risk factors include: a high-fat and low-fiber diet, lack of exercise, obesity, excess alcohol consumption, and increasing age. Cancer is a disease caused by alterations in the DNA, some of the risk factors that we cannot control. The genes that normally regulate cell growth and division during the cell cycle include genes for growth factors, their receptors, and the intracellular molecules of signaling pathways. Mutations that alter any of these genes in somatic cells can lead to cancer. The agent of such change can be random spontaneous mutation. 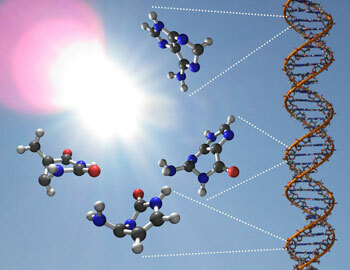 However, it is likely that many cancer–causing mutations result from environmental influences, such as chemical carcinogens, X–rays and other high-energy radiation, and some viruses. Transformation of normal cell into cancerous Cancerous cells, in contrast to normal cells, divide and grow uncontrollably forming malignant tumors. How a normal cell changes into cancerous? Normal cells in our body – grow, divide, mature, and die in response to a complex set of internal and external signals. A normal cell receives both stimulatory and inhibitory signals, and its growth and division are regulated by a delicate balance between these opposing forces. In a cancerous cell, one or more of the signals has been disrupted, which causes the cell to proliferate at an abnormally high rate. As they lose their response to the normal controls, cancer cells gradually lose their regular shape and boundaries, eventually forming a distinct mass of abnormal cells – a tumor. If the cells of the tumor remain localized, the tumor is said to be benign; if the cells invade other tissues, the tumor is said to be malignant. Genes play a major role in causing cancer Over 90 percent of cancers are observed to have some type of genetic alteration. What drives cancer cells to grow and divide uncontrollably turning into cancer? Current research is trying to reveal some clues about how normal cellular processes at its DNA level mutate and go awry on. One out of every two women and one out of every three men will develop cancer during their lifetime. The cancer genes currently known includes 70 genes associated with germ-line mutations and 342 genes associated with somatic mutations. Somatic mutations are the most common cause of cancer. These mutations occur from damage to genes during a person&apos;s life, and they are not passed from parent to child. Tobacco use, exposure to ultraviolet (UV) radiation, viruses, and age can damage genes and cause these mutations. Cancer that occurs because of somatic/acquired mutations is called sporadic cancer. Less commonly, a mutation can be in every cell of a person&apos;s body from birth. These mutations are typically passed from a parent to a child. This is called a germ-line mutation. Cancer caused by germ-line mutations is called inherited cancer, which makes up about 5% to 10% of all cancers. However, mutations in two basic classes of genes – proto-oncogenes and tumor suppressor genes – are responsible to lead cancer. Proto–oncogenes can become oncogenes Proto–oncogenes encode for normal cellular proteins involved in growth signaling pathways. When these genes become mutated as a result of exposure to chemicals, radiation, or other carcinogens, these genes are called oncogenes. Proto–oncogenes are a group of genes that cause normal cells to become cancerous when they are mutated. 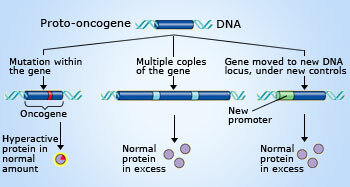 The mutated version of a proto–oncogene is called an oncogene. The main function of proto–oncogenes is to encode proteins that function to stimulate cell division, inhibit cell differentiation when completed, and halt cell death. All these phenomena are important for normal human development and for the maintenance of tissues and organs. Many proto-oncogenes also play an important role during embryogenesis, because they are often involved in stimulating cell growth and proliferation as an organism develops. Proto-oncogene activities are typically turned off once the developmental processes they regulate are completed. However, if proto-oncogene activity remains high, or if proto-oncogenes are inappropriately reactivated later in life, cancer may occur. In contrast to this, oncogenes, however, typically exhibit increased production of proteins, thus leading to increased cell division, decreased cell differentiation, and inhibition of cell death, thus finally all these phenotypes define cancer cells. Due to this, oncogenes are currently a major molecular target for anti–cancer drug design. Mutations in proto-oncogenes These are typically dominant in nature, and the mutated version of a proto-oncogene is called an oncogene. How proto-oncogene transforms to oncogene? point mutations in a control element or in the proto–oncogene itself. in the coding sequence, changing the gene’s product to a protein that is more active or more resistant to degradation than the normal protein. All these mechanisms can lead to abnormal stimulation of the cell cycle and put the cell on the path to malignancy. Fate of tumor–suppressor gene Tumor suppressor gene mutations and deletions result in loss of growth inhibitory pathways. In addition to genes whose products normally promote cell division, cells contain genes whose normal products inhibit cell division. Such genes are called tumor-suppressor genes because the proteins they encode help prevent uncontrolled cell growth. Any mutation that decreases the normal activity of a tumor-suppressor protein may contribute to the onset of cancer, in effect stimulating growth through the absence of suppression. 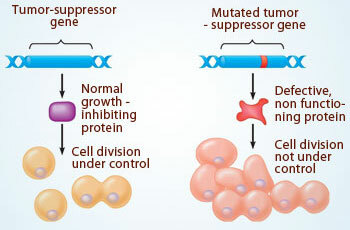 The protein products of tumor–suppressor genes have various functions. Some tumor suppressor proteins repair damaged DNA, a function that prevents the cell from accumulating cancer–causing mutations. Other tumor–suppressor proteins control the adhesion of cells to each other or to the extracellular matrix; proper cell anchorage is crucial in normal tissues and is often absent in cancers. Still other tumor–suppressor proteins are components of cell–signaling pathways that inhibit the cell cycle. P53 has many mechanisms of anti–cancer function It plays a role in apoptosis, genomic stability, and inhibition of angiogenesis. The P53 gene, named for the 53,000–Dalton molecular weight of its protein product, is a tumor-suppressor gene. The protein it encodes is a specific transcription factor that promotes the synthesis of cell cycle–inhibiting proteins. That is why a mutation that knocks out the P53 gene, like a mutation that leads to a hyperactive Ras protein (oncogene), can lead to excessive cell growth and cancer. The P53 gene has been called the &QUOT;guardian angel of the genome.&QUOT; Once the gene is activated – for example, by DNA damage – the P53 protein functions as an activator for several other genes. Often it activates a gene called P21, whose product halts the cell cycle by binding to cyclin–dependent kinases, allowing time for the cell to repair the DNA. 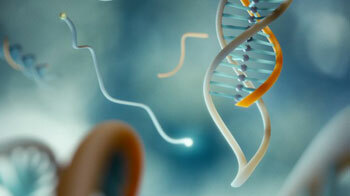 In addition, the P53 protein can turn on genes directly involved in DNA repair. Finally, when DNA damage is irreparable, P53 activates &QUOT;suicide&QUOT; genes, whose protein products bring about programmed cell death (apoptosis). 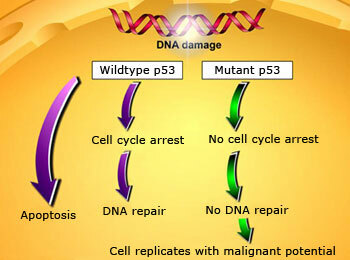 Thus, P53 acts in several ways to prevent a cell from passing on mutations due to DNA damage. Transformation of normal cells into cancer cells entails concerted changes in the expression of many genes. Identifying which of those genes are crucial will provide insight into the mechanisms underlying malignancy. Radiation therapy for cancer Radiotherapy uses targeted X–rays to destroy cancer cells while reducing the impact of radiation on healthy cells. Cancer research ranges from causes, molecular bioscience to the performance of clinical trails to evaluate and compare applications of the various cancer treatment. These applications include surgery, radiation therapy, chemotherapy, immunotherapy and combined treatment modalities such as chemo–radiotherapy, stem–cell transplantation etc. Starting in the mid–1990s, the emphasis in clinical cancer research shifted towards therapies derived from biotechnology research, such as immunotherapy, gene therapy and targeted drug therapy. If the cancer is benign, that is if the cancer has not spread to other parts of the body, surgery can be used to diagnose, treat, or even help prevent cancer in some cases. It often offers the greatest chance for cure. The different types of treatment options for malignant tumors are as follows: Chemotherapy is the use of medicines or drugs to treat cancer. 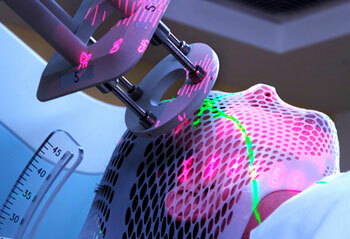 Radiation therapy uses high–energy particles or waves to destroy or damage cancer cells. It is one of the most common treatments for cancer, either by itself or along with other forms of treatment. Nanoparticle drug therapy in cancer treatment Nanotechnology cancer treatments would use gold particles to carry anticancer drugs straight to the cancer. This is the part of targeted drug therapy. Oncology is a branch of medicine that deals with cancerous tumours and an oncologist is a medical professional who practices it. Immunotherapy is a kind of treatment that uses the patient body&apos;s own immune system to help fight cancer. It involves stimulating the patients own immune system to work harder or smarter to attack tumor cells and giving the immune system components, such as man-made immune system proteins. Targeted therapy is a newer type of cancer treatment that uses drugs or other substances to more precisely identify and attack cancer cells, usually while doing little damage to normal cells. 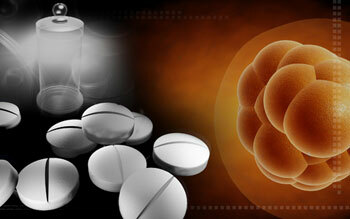 Targeted therapy is a growing part of many cancer treatment regimens. For example, Herceptin is a drug which is extensively used now–a–days to keep a check on tumor growth for certain cancers. It is approved to treat certain types of breast cancer as well as some types of gastro–esophageal junction adenocarcinoma. This drug binds to the Human Epidermal Growth factor Receptor 2 (HER–2) in the body. HER-2, a receptor with tyrosine kinase activity, is expressed at high levels in some breast cancers and also some other types of cancer. Chemotherapy can cause a variety of ailments, including hair loss, digestive problems, nausea, lack of energy and mouth ulcers. But nanotechnologists think they have an answer for treatment as well, and it comes in the form of targeted drug therapies. If scientists can load their cancer-detecting gold nanoparticles with anticancer drugs, they could attack the cancer exactly where it lives. Such a treatment means fewer side effects and less medication used. Getting rid of cancer from stem cells Experts believe the theory of cancer stem cells may be of great importance for future treatments. 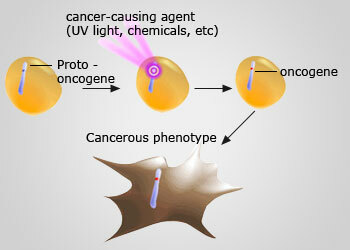 Photodynamic therapy or PDT is a treatment that uses special drugs, called photo–sensitizing agents, along with light to kill cancer cells. The drugs only work after they have been activated or &QUOT;turned on&QUOT; by certain kinds of light. Today, newer tools allow more precise delivery of heat, and hyperthermia has been studied for use against many types of cancer. Lasers, which are very powerful, precise beams of light, can be used instead of blades (scalpels) for very careful surgical work, including treating some cancers. Angelina jolie – Inspiring millions of women to be proactive about safeguarding their own health. She wants to encourage every woman, especially if they have a family history of breast or ovarian cancer, to seek information from medical experts who can help them to make their own informed choices. Life comes with many challenges. The ones that should not scare us are the ones we can take on and take control of. Cancer is still a word that strikes fear into people&apos;s hearts, producing a deep sense of powerlessness. Let&apos;s read on to know how some of the world&apos;s best celebrities battled cancer. The Oscar–winning actress, Angelina Jolie decided to have a preventive double mastectomy as cancer runs in her family and she carried a "faulty" gene, BRCA1, which sharply increases the risk of developing breast cancer (Detected by mammogram) . Doctors estimated that she had an 87 percent risk of breast cancer, although the risk is different in the case of each woman. She decided to be proactive and to minimize the risk as much she could. She decided to have a preventive double mastectomy which reduced the chances of developing breast cancer from 87 percent to under 5 percent. She also shared her story to inspire millions of women to be proactive about safeguarding their own health. “Can't run away from cancer, got to fight for your life” When it comes to toughness, cancer survivors are up there. And Yuvraj Singh is a prime example. His story inspires millions. 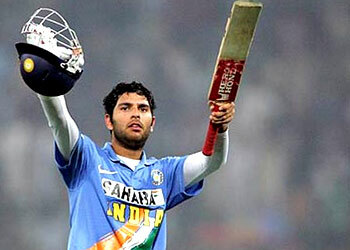 Yuvraj Singh, Indian international cricketer was on the top of the world in 2011, having helped India lift the World Cup. His performance in the series was exemplary and he was even adjudged the Player of the Series. So it came as a quite shock when the aggressive southpaw was diagnosed with a cancerous tumor in his left lung. Yuvraj was diagnosed with a malignant tumor between his lung and heart known as seminoma. Seminoma is a germ cell tumor of the testis or, more rarely, the mediastinum (region located between the lungs ) or other extra-gonadal locations. It occurs due to genetic predisposition developed during the fetal development phase and is relatively rare. He underwent chemotherapy treatment at the Cancer Research Institute in Boston as well as Medicine Facilities in Indianapolis, Indiana. He was discharged from the hospital after the third and final cycle of chemotherapy and doctors declared that the chances of recurrence were almost nil and Yuvi's (as he is fondly called) cricketing career continued. 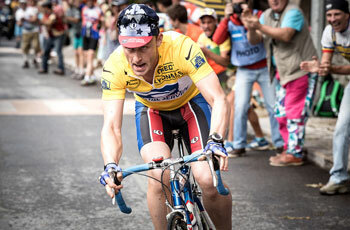 Lance Armstrong inspires others to live strong His miraculous cancer journey serves as an inspiration to cancer patients and survivors worldwide. Cancer puts you to the test and it also brings out the best! Lance Armstrong&apos;s (an American former professional road–racing cyclist ) story of cancer survival reads like an oncological tall tale. In 1996, he was diagnosed with testicular cancer that had spread to his abdomen, lungs, and brain at the young age of 25. The odds were against his survival, but within two years, Armstrong was deemed cancer–free after undergoing extensive chemotherapy and surgery. There is no debate that Lance Armstrong is one of the greatest health turnarounds of the decade. To survive such advanced cancer when statistically he should have died, go on to win five more Tour de France competitions, sounds like a movie script than a biography. His miraculous cancer journey serves as an inspiration to cancer patients and survivors worldwide. Novel methods for early diagnosis and treatment of specific cancers are being developed that rely on new techniques for analyzing, and perhaps interfering with, gene expression in tumors. Ultimately, such approaches may lower the death rate from cancer. The study of genes associated with cancer, inherited or not, increases our basic understanding of how disruption of normal gene regulation can result in this disease. The ability of cancer cells to evolve rapidly and uncontrollably, combined with the heterogeneous nature of cancer cell populations, will continue to challenge researchers in years to come. Thus, like cancer cells, our approach to cancer therapy must also continue to evolve.